The pictures of boat covers keep rolling in! Another pleased customer, Kenneth, sent us some excellent photos of his nearly 30 foot Scarab covered in a Caribbean blue cover made by Carver Industries. The cover you see here is one of our styled to fit covers which is made for his boats style and length. 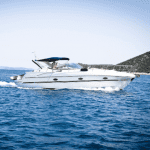 All Carver boat covers are made with special care, and they feature double stitched hems. Their custom covers are even made with extra reinforcement where wear might occur, such as consoles and trolling motors. Even better, they are USA made. Kenneth’s main reason for getting this cover was to have something to protect the boat while trailering. While we recommend he tie the cover down in a few more places before getting on the road, he is otherwise pretty much ready to go! It is important before you trailer with any cover to verify that the cover is trailerable. Some covers are designed for storage only and can’t handle the high speeds and friction that comes along with traveling on the interstate. Most all of our Carver Boat Covers are trailerable and come with a tie-down kit. The heavy-duty straps that make up the tie-down kit are made to wrap around the legs of the trailer, and snug tightly with the use of adjustable buckles. It’s always a good idea to regularly inspect the cover during your trip to be sure all straps are tight as possible because wind and friction can sometimes work to move the cover around. Not sure if your cover is trailerable? Simply contact the manufacturer of the cover or the retailer you bought it from. Almost all of our covers will allow trailering, but contact us directly if you are unsure. Having Trouble Locating a Boat Cover? Contact us if you have any questions or concerns about covering your boat! You can call us directly at 1-866-626-8377 toll free! If you already have a Carver Boat Cover, we would love to see your photos! 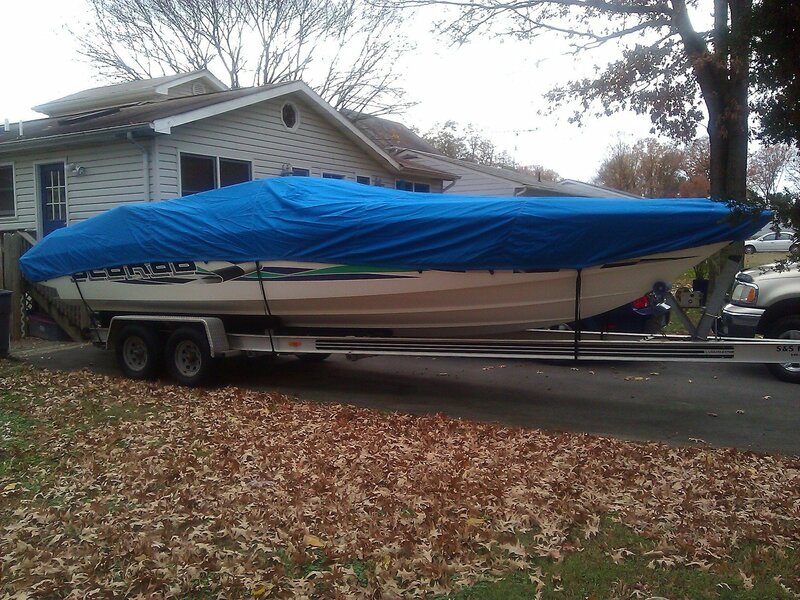 A shout out to Kenneth for sending us pictures of his Scarab Boat Cover!